Welcome to our page featuring amazing modern pergola designs that you can use for ideas and inspiration. 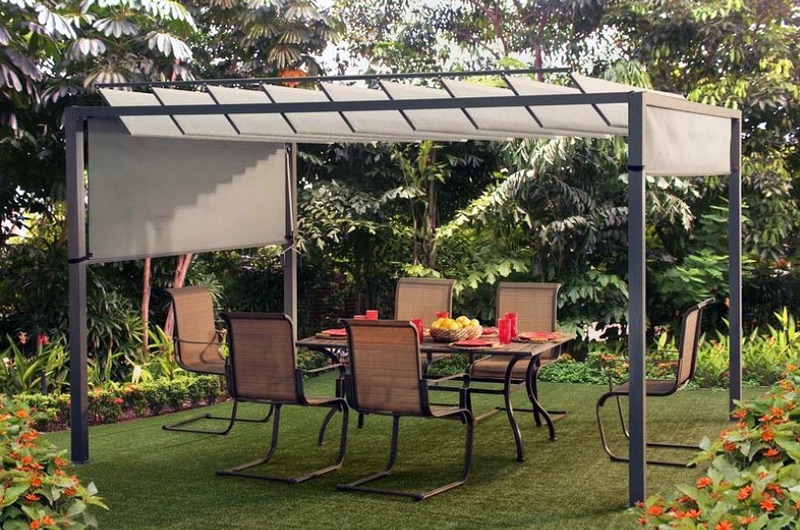 Pergolas are garden features that provide welcome respites of shade from the sun. 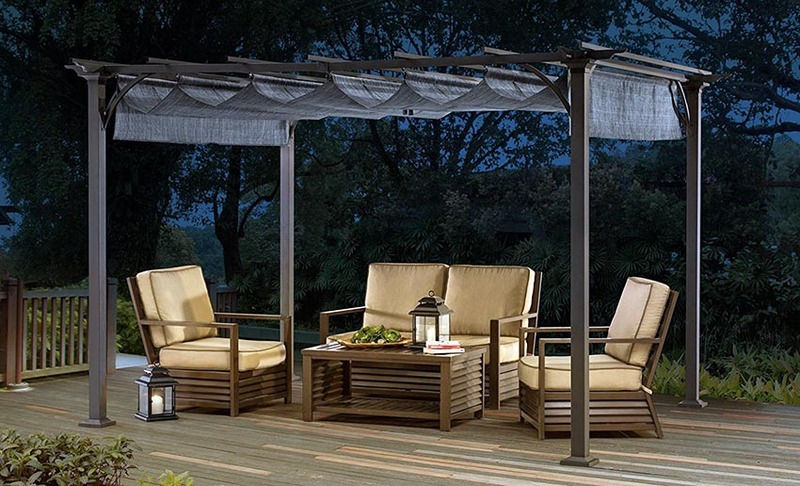 A sub-genre of gazebos, these are used on outdoor walkways, paved paths, and exterior sitting areas. The defining feature of a pergola is its lattice or cross-beam “roofs” that are supported by pillars. The latticework is often strewn with vines and crawling floral landscape elements. Pergolas can come as extensions of a building but can also be free standing. As free standing structures, they serve as lattice roofs over open decks or terraces or as roofed links between garden pavilions. Although not inherently providing seating features, pergolas that cover open terraces house spaces for outdoor lounging areas. These types of setups give users plenty of natural sunlight and refreshing breezes. With their latticework covers, pergolas are good at providing shade but might not be effective at keeping out rain or snow. Nevertheless, pergolas are great additions to any landscape design or backyard setup. They can function as shelters and as feature design pieces. The modern pergola design shown in the picture above has a simple four post structure with lintel assemblies arranged in a row. 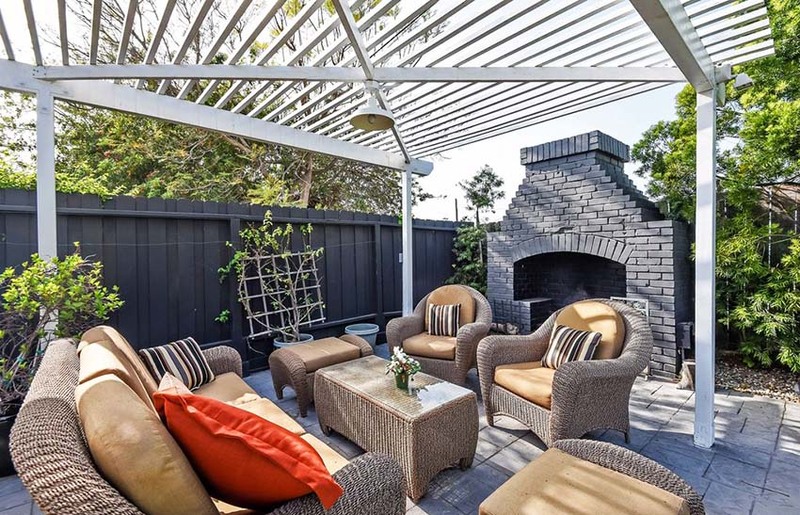 The modern design element helps define a space and frame the deck area with a long rectangular fire pit under a pergola to create an inviting spot for relaxing. History – Pergola comes from the Latin pergola, which means a projecting eave. Early records show the design feature being used as early as 3000 years ago. It was used in 1400 BC for Egyptian gardens entrances for possibly aesthetic and weather-related functions. 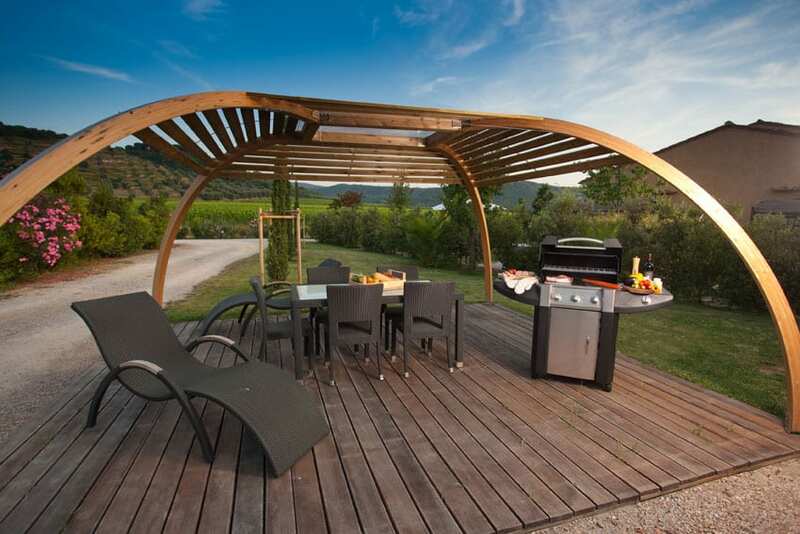 Since then, these types of gazebos have been known for both their functional and aesthetic qualities. They have frequently been used in the landscape design of high class members of society as landscaping features, but have also been known to be used by common farmers as a means to effectively cultivate growing and climbing vine producing plants. There was a brief dip in the pergola’s popularity in landscape architecture back in the 18th and 19th centuries. However, by the time the 20th century came, magnificent stone pillared variations of pergolas became in fashion again. This was mostly thanks to the efforts of designers Lutyens and Jekyll. 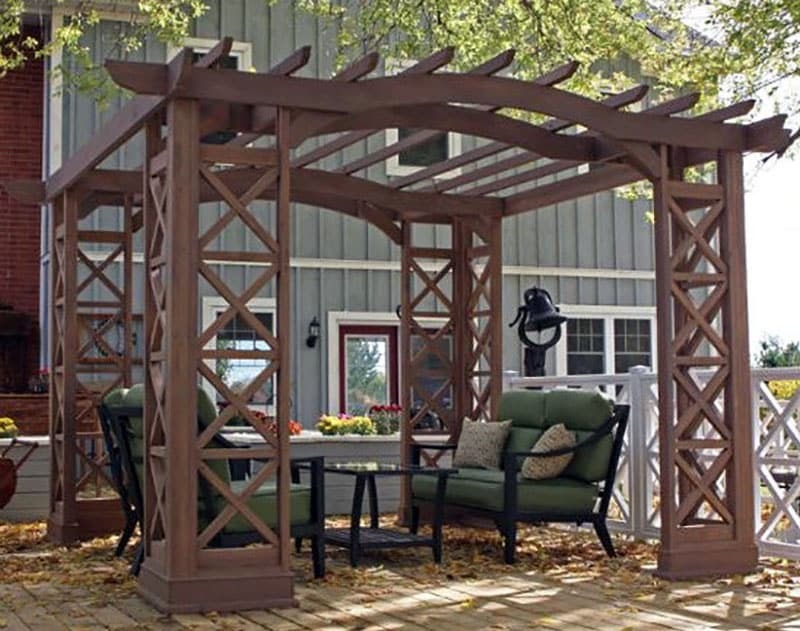 With centuries of continued use under its belt, the pergola has cemented its reputation as a timeless piece of design. You can find more traditional pergola ideas here. 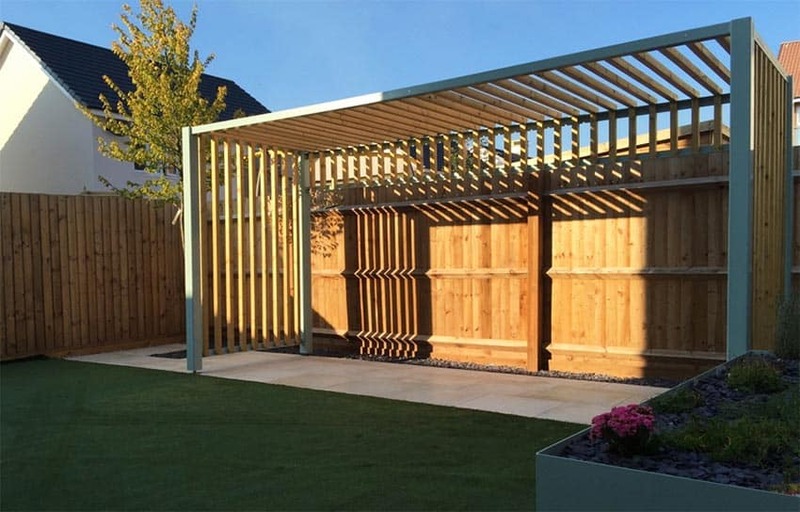 Modern pergola designs can also consist or numerous smaller louver elements that can really function well as sun shades or semi-transparent wall partitions for your garden spaces. Modern pergola designs nowadays have a wide variety of uses and come in different forms. They can be small structures that are used to shade stoops or front doorsteps, they can also be larger structures that cover a whole outdoor terrace used for garden parties or social gatherings. In general, modern pergolas can be categorized based on roof design, materials, and functionality. For roof designs, there are two basic types – gable pergolas and flat roof pergolas. Gable pergolas have rafters that slope down on two opposing sides. This gives you more ceiling space and can create a more “traditional” roof look. These can be used when it is important to make your pergola more cohesive design-wise to your house’s main roof. Flat roof pergolas are more flexible than their gabled cousins. With a simple, single sloped crown, flat roof variants can be used in tighter spaces and more restrictive pergola shapes. Pergolas can also be characterized based on their materials. 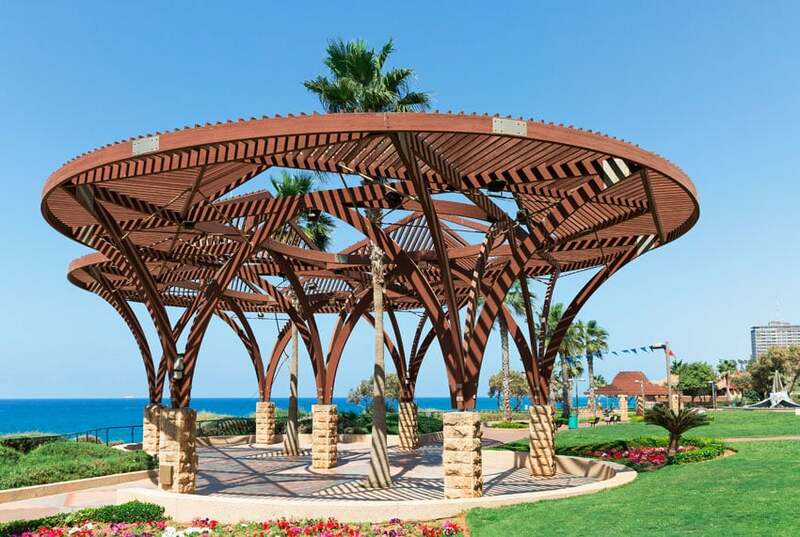 The more common materials used for pergolas are wood, vinyl, fiberglass, and metal. 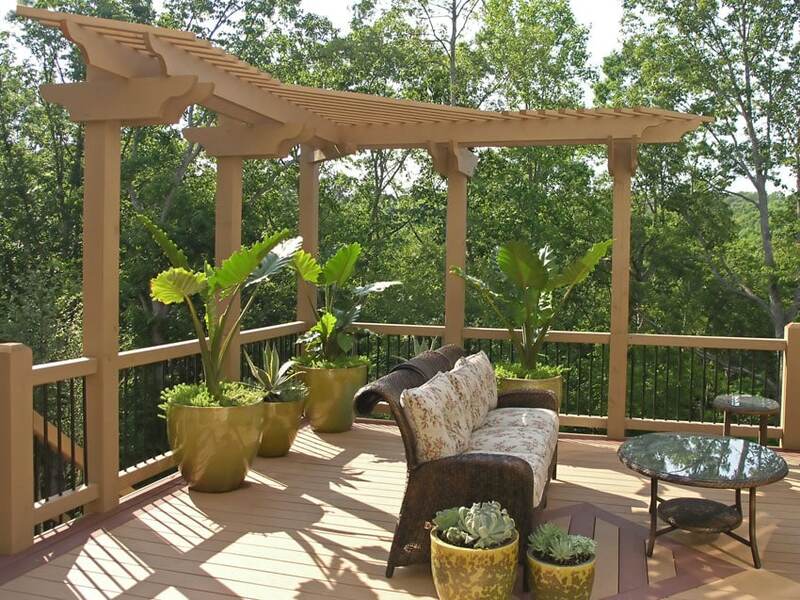 Wooden pergolas need to be made of weather-resistant wood or treated to be weather-resistant. This is especially true for harsher climates such as places with winters or with constant rainfall. Vinyl and fiberglass pergolas are more resistant and hardy than wooden ones. They’re also much more low-maintenance and do not need regular painting or staining nearly as much as wooden pergolas. Metal pergolas are the longest-lasting of the bunch and are quite often manufactured beforehand, making installation quick and easy. Many offer rust preventative properties to help them handle outdoor weather conditions. 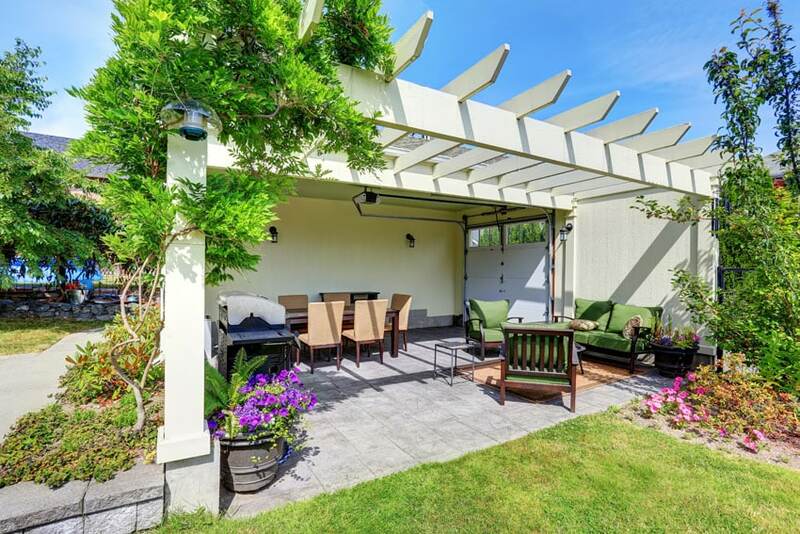 Pergolas need not always be located underneath a pathway or an outdoor deck. They can also be used as feature pieces for garden water features such as this pond-waterfall piece. Pergolas can come in all different shapes and layouts. This L-shaped pergola was designed specifically to be placed as an attachment to the corner of this railed outdoor deck. Attached pergolas can also be used to designate a specific corner of your backyard garden as a lounging space for friends and family. 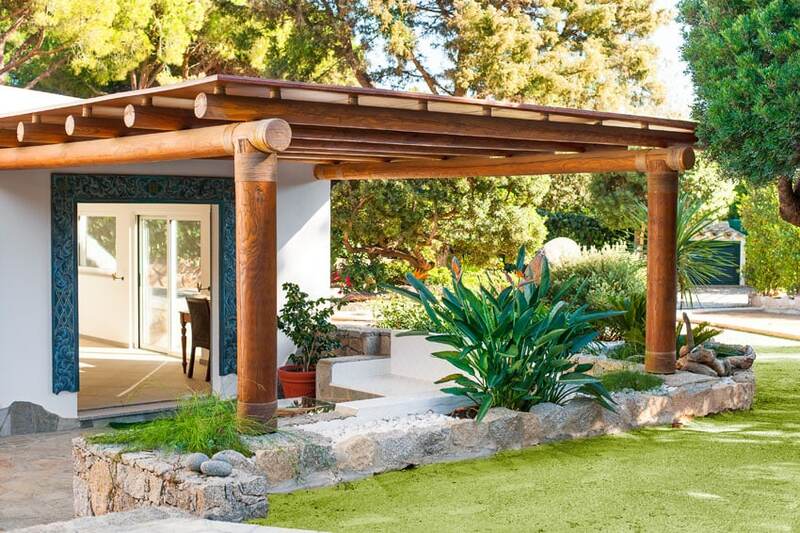 Depending on the look you’re going for, pergolas can also be creatively setup. Take a look at this round, in-laid star shaped pergola with interesting branching columns and trusses. 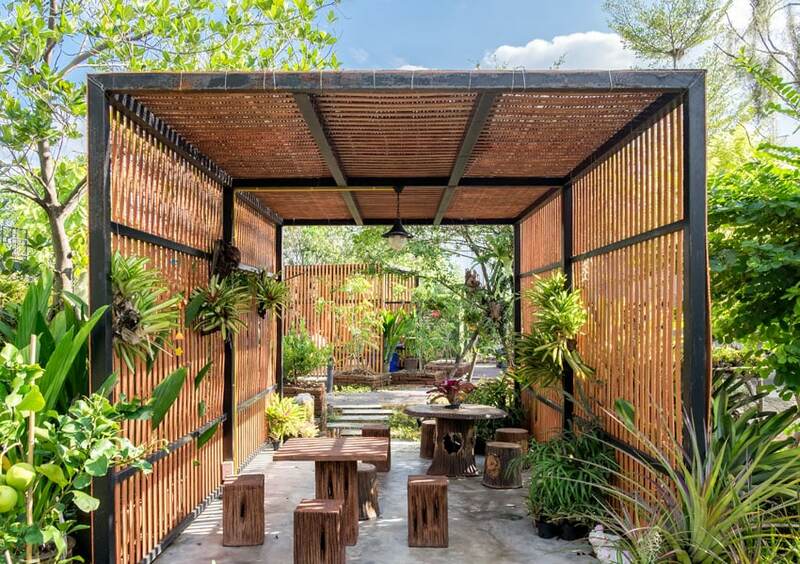 Pergolas can also be used to line long outdoor benches and provide some much welcome shade from the sun to those who want to take a break and sit for a while. Spaces crowned with pergolas are commonly used for outdoor social activities such as al fresco dining or the occasional weekend barbecue. 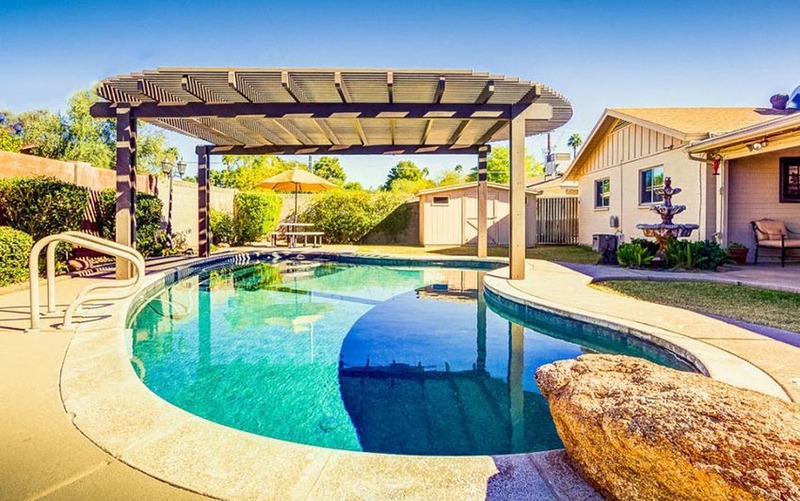 This unique modern pergola design utilizes curved beams with horizontal slats to provide the perfect amount of shade for outdoor dining. See more modern deck ideas here. Larger louvers used for pergolas are recommended for harsher sunlight. This can be utilized for more tropical climates or locations nearer the equator. 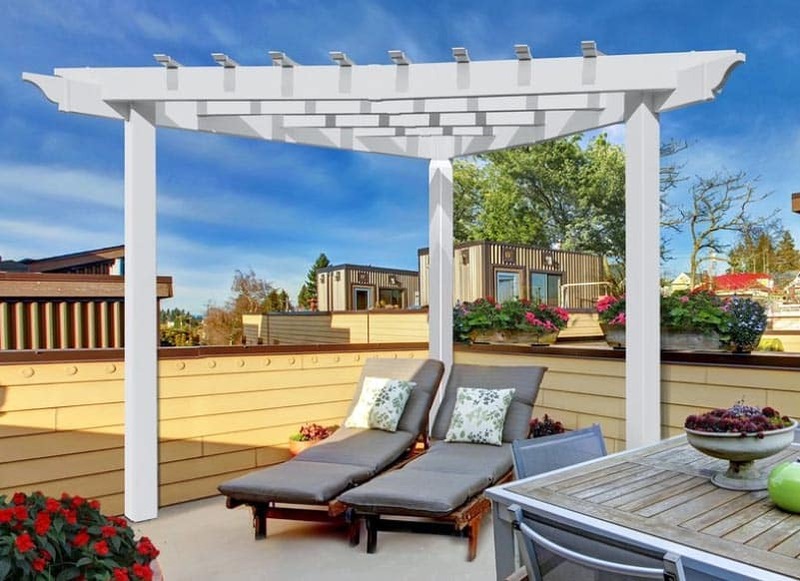 A good use of a pergola is utilizing it as a way to centralize gathering places. You can also hang pendant lights from the trusses to make the space usable even at night. 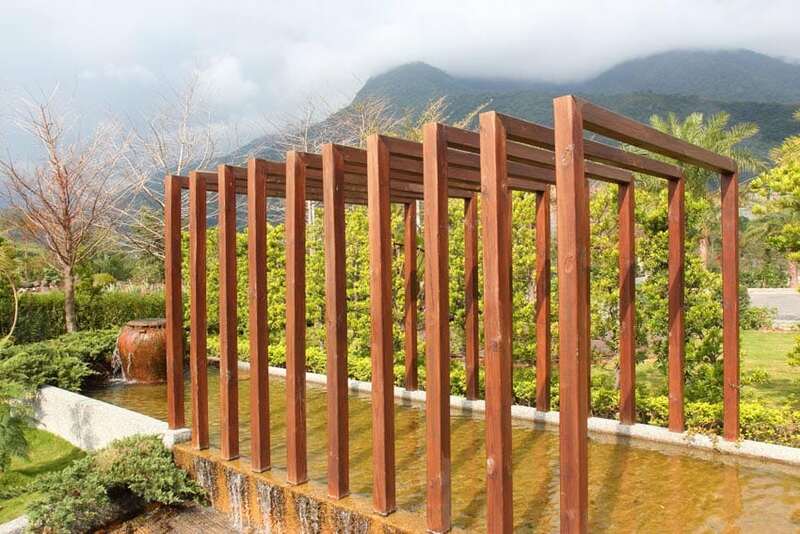 You can even use pergolas over your freeform or kidney shaped personal pools, in case you’d prefer to take a refreshing dip in the water but don’t want all that sun on you. See more modern swimming pool designs on our gallery page. Pergola kits are usually synonymous with “custom” or “do-it-yourself” kits, custom kits being those specially tailored and manufactured by suppliers and do-it-yourself kits being kits that are store-bought and designed to fit a wide variety of garden designs. Custom kits that are specified and tailored for more unique garden design contexts are a bit more pricey than those that are made for more general installations. With modern pergola kits, they could either be attached or free-standing. Attached pergolas are connected or mounted against an existing wall, most often of the house it services. 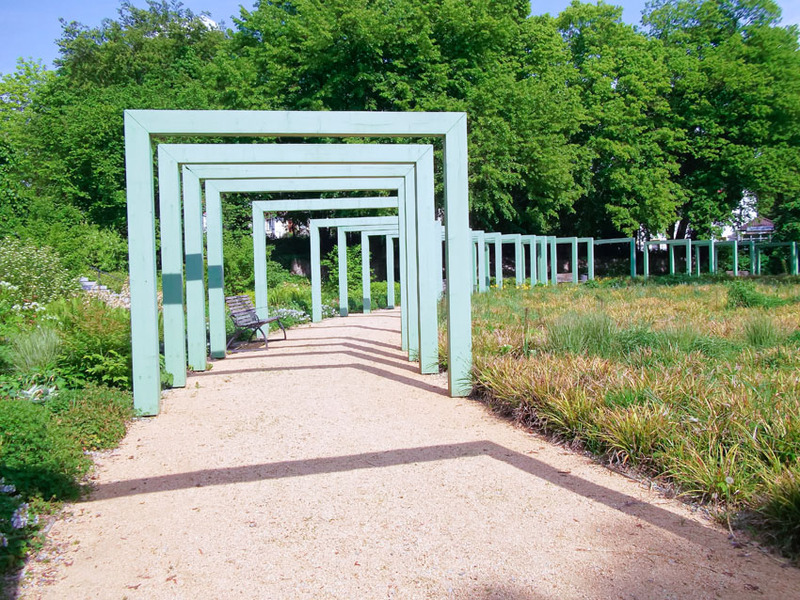 Free standing pergolas are anchored or driven into the ground and does not connect to any major buildings and stands by itself. Free standing pergolas are usually more expensive than attached pergolas due to the labor and materials spent in making it a structure that can support itself. Corner niches on roof decks or open terraces can be made just a little bit more cozy and intimate by adding a triangular, three-legged pergola onto the space. Modern pergola kits make it possible to put up pergola setups on already existing decks. 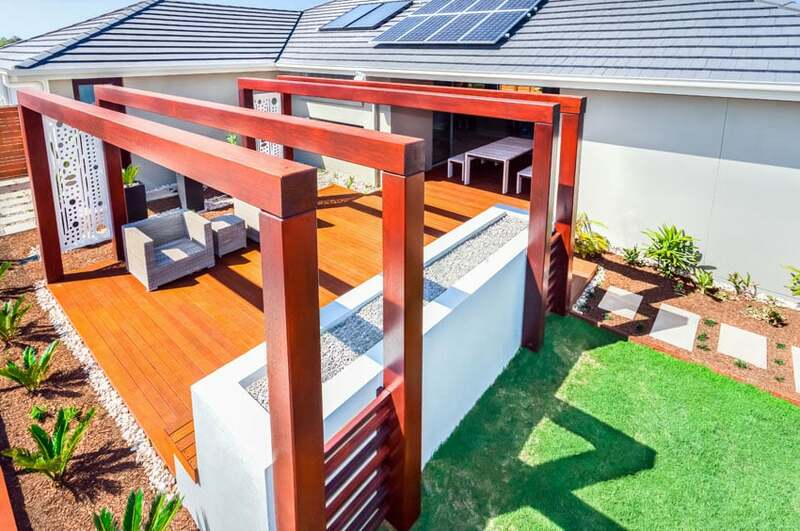 With the variety of pergola types available, you should have no trouble finding one that suits your exact needs. For homeowners that enjoy the freedom of choice for the outdoor spaces, retractable pergolas are heaven-sent. Retractable pergolas have an operable canopy that can be retracted or extended, to switch between open-sky layouts and shaded, covered layouts. This is perfect for houses in places with unpredictable weather. Retractable pergolas make it possible to somehow regulate the amount of protection you get from natural sunlight or unexpected rainfall. 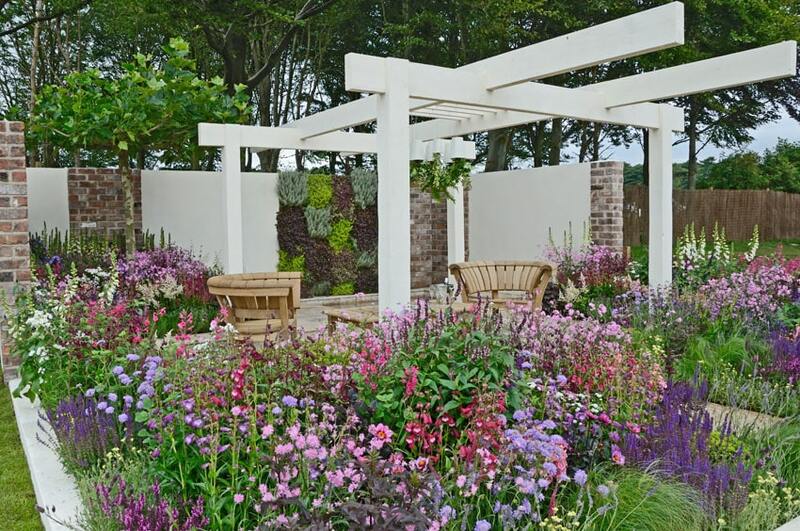 Inspirational garden layouts are meticulously and intelligently planned to really create spaces that uplift and elevate your experience in them. Pergolas can greatly enhance your garden designs by providing a venue to showcase comfortable outdoor furniture as well as also providing a space for social congregations and garden parties. Aside from their functional nature, they can also serve as feature centerpieces for landscape designs and can enhance the space all the more. Adding a pergola to a beautiful flower garden creates a stark contrast that, in many ways, enhances the design of the landscaping. Pergolas can be used as design features for most backyard landscaping setups. See more modern patio ideas here. Rows of beams and columns can be erected along long pathways to frame the views one gets when walking through. This creates a very unique and stimulating design experience. 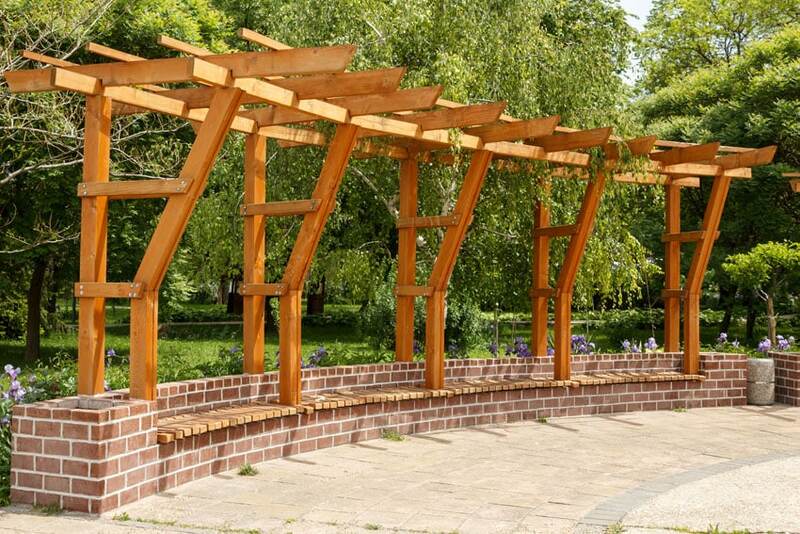 As mentioned earlier, pergolas can come in different shapes, sizes, and materials. There are wooden, plastic, and metal pergolas. Metal pergolas are among the most durable of the bunch and can be flexible and easy to install. For most cases, metal pergolas come as kits and are ready to install assemblies just waiting to be put up. DIY installed metal pergola kits are perfect for adding quaint dining spaces onto already existing lawn and garden designs. 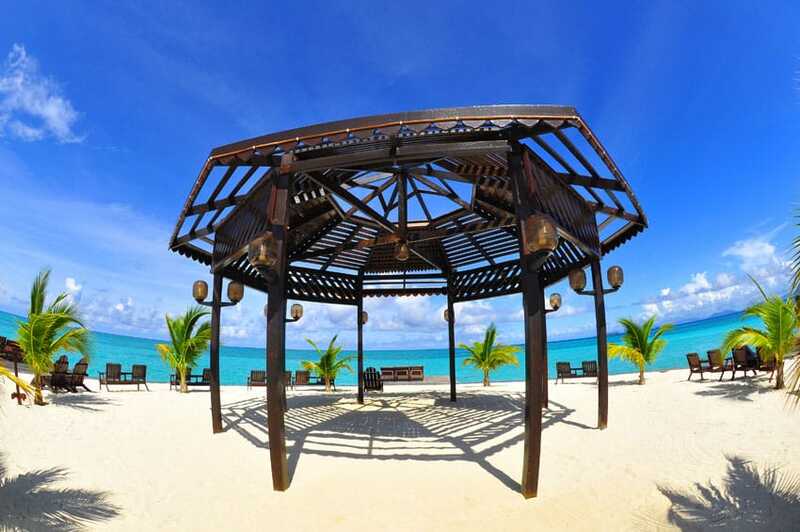 Metal modern pergola designs are perfect for seaside venues since, with the right amount of coating and treatment, they can withstand the harshness of sea air and weather.